The Swedish economy is expected to continue to grow during 2018. According to the Swedish government's 2018 macroeconomic assessment, growth is expected to reach 2.8 per cent during 2018 and slow down to 2.2 per cent during 2019. Growth during 2018 is expected to be driven by higher exports, increased private investments and increased consumption, both private and public. Competition between the banks continues to be fierce, and new categories of lenders (such as insurance companies, pension funds and specialised debt funds) are active on the market, in particular with respect to long-term credit. Sponsors and other borrowers are using the increasing competition, including from the Nordic high-yield bond market, to achieve more attractive terms. The easy access to capital reduces refinancing risks and helps many companies that would face financial distress in a harsher market to avoid the need to undergo restructuring measures. Even though the economy is growing, the unemployment rate is falling, interest rates are low and the bank and capital markets offer attractive financing terms, certain industries are facing industry-specific challenges, for example, the print media industry and industries with exposure to energy prices. Some property development companies may also face difficulties owing to excess supply in certain parts of the property market. 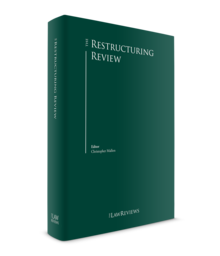 In 2017, 5,528 limited liability companies entered formal bankruptcy proceedings and 147 companies entered formal company restructuring proceedings (with judicial composition). For 2017, the figures were 5,270 and 182, and for 2016, 5,484 and 160, respectively – indicating a slightly increasing trend for bankruptcies. As is apparent, bankruptcy is a far more frequently used procedure than formal company restructuring. In practice, most restructurings are done informally, without the involvement of the courts or any public authorities. As the lenders maintain full control in out-of-court proceedings this is a preferred route compared with in-court proceedings. The spate of bankruptcies in the early 1990s has also had a permanent effect on the Swedish market as most lenders then realised that it is often economically more viable to restructure ailing firms outside formal procedures. Informal restructuring has, therefore, largely become the preferred solution. That said, there are circumstances in which judicial procedures are needed and can be efficiently employed to restructure and finance distressed companies. The techniques employed in restructurings have developed and become more sophisticated. The main driver for this development has been the larger restructuring cases of recent years and the international restructuring market has also been an influence. An increase in both international groups' insolvencies and also a growing market for distressed debt transactions has increased the awareness on the local market. In addition, the growing Nordic high-yield bond market has added layers of complexity to restructurings, not only due to the different kind of terms for bonds compared with loans, but also with respect to the different objectives of bond investors compared with bank lenders. In Sweden, there are two main formal proceedings available for companies in financial difficulties: company restructuring and bankruptcy. A company may also be mandatorily liquidated. Mandatory liquidation is triggered by the equity of the company being less than half of its registered share capital (this is essentially a balance-sheet solidity test) and is often caused by over indebtedness. Bankruptcy is triggered by insolvency, which means that the debtor is not able to discharge its debts as they fall due and that such inability is not only temporary. Bankruptcy aims at the disciplined liquidation of the company's assets with a view to optimising creditor returns and usually ends with the liquidation of the company. Formal company restructuring is based on a 'prospective illiquidity' test and aims at restructuring a company's financial position so that it can continue operations with reasonable prospects of profitability. Company restructuring takes place under the supervision of a court-appointed 'reconstructor' and bankruptcy is managed by a court-appointed administrator, who takes the place of the shareholders and directors in managing the company's business. Although Swedish insolvency law does not provide for extensively 'pre-packed' insolvency procedures, it is common for some element of pre-packaging to take place, usually in close cooperation with an administrator appointed by the court. The courts normally accept the company's choice of official if it is supported by the largest secured creditors. In recent years there have been a number of successfully pre-packed deals within the real estate sector with sales of distressed real-estate portfolios via an official auction process conducted by the Swedish Enforcement Authority. The advantage of choosing the formal auction process in these types of transactions is that any sale of real property made through a formal auction process effectively extinguishes all claims and security in relation to the sold property. Thus, if existing junior creditors do not consensually agree to an informal debt restructuring, a formal auction process could be a way to squeeze out such creditors and sell the property free from claims and encumbrances. Obviously, such pre-pack solutions need to be carefully planned and structured in order to maximise the value of the sold assets. A formal company restructuring aims to achieve a financial workout of financially distressed companies that are deemed to have sustainable long-term business prospects. Financially distressed companies can apply for a restructuring with the local court. An application will only be approved if the company is unable to pay its overdue debts or will be unable to do so in the near future and there are reasonable grounds to believe that the restructuring can achieve its purpose. When approving the restructuring the court appoints a 'reconstructor' to manage the restructuring. Formal company restructuring is a debtor-in-possession proceeding where the management and board of directors of the company remains in control of the business but supervised by the reconstructor. The reconstructor will, inter alia, investigate the financial situation of the company and, together with the company, establish and implement a restructuring plan. The creditors will be afforded an opportunity at the creditors' meeting to express opinions regarding whether the company restructuring should continue. If requested by any of the creditors, the court will appoint a creditors' committee of no more than three to four persons from among the creditors. Representatives for the Swedish Tax Authority, the largest secured creditor and the employees are normally included in the committee. The committee is purely advisory; in matters of material importance the reconstructor is obliged to consult with the committee but is not bound by any advice given. Crucial for the success of the restructuring is often that the total unprioritised debt of the company is decreased to a manageable level in order for the company to regain its financial viability. The composition may be conducted on a voluntary basis; however, more commonly, the negotiations will aim at a mandatory judicial composition, during which claims of creditors who are entitled to participate in composition proceedings may be mandatorily reduced. The composition should provide all entitled creditors with similar rights at least 25 per cent of the amount of the claims, unless a lower composition percentage is approved by all known creditors who would be covered by the composition, or where special cause exists for a lower percentage. Only creditors whose claims arose prior to the application for company restructuring may participate in composition proceedings. A creditor whose claim enjoys priority or can be satisfied through set-off will not participate, nor may a subordinated creditor participate in the proceedings, unless the other creditors who are participating in the proceedings so consent. There is case law to suggest that a creditor is subordinated in company restructuring only if this is clear from the relevant agreement; but subsequent statutory changes may inadvertently have changed the law in this regard, in which case a creditor contractually subordinated in bankruptcy will automatically also be subordinated in a company restructuring. An obvious advantage of a judicial composition is that, contrary to a voluntary write-down of debts, not all (participating) creditors need to agree to the write-down provided that an acceptable majority has done so. Before proposing a composition, however, the company and reconstuctor should bear in mind that major trade creditors can play a vital role in the success of the restructuring, for example, by extending credit periods or converting their trade credits into long-terms debt. Any forced compositions could therefore jeopardise relations with important trade partners and reduce the chances of a successful restructuring. A sometimes useful effect is that judicial composition will effectively extinguish all subordinated claims in the company. Thus, by just achieving a smaller composition with the unprioritised creditors, all subordinated debt will automatically be extinguished and the capital structure of the company can be significantly improved, which will also have a positive impact on the value of the remaining debt and the value of the shares in the company. From the point of view of the subordinated creditors this is unreasonable since it puts the shareholders' interests before the subordinated creditors, the claims of which are being extinguished, whereas there is no possibility to, for example, reduce the shareholders' equity interests correspondingly without the consent of the shareholders. One of the most important features of the company restructuring regime is that a new financier can be given a 'super-priority' right in respect of any new debt provided by it, with the consent of the reconstructor, during the restructuring. In order to facilitate a formal restructuring and for the company subject to such to regain financial stability and be able to continue its business, the Swedish Preferential Rights of Creditors Act contains a provision giving 'super-priority rights' to claims that are assumed and approved by the reconstructor during the restructuring. Pursuant to the Act such claims are given general priority and rank before other claims of general priority such as claims for compensation for the performance of auditing functions required by law, employees' claims for wages or other compensation arising from the employment, certain pension benefits and claims with priority connected to floating charges. Although the super-priority right is essential in finding new financiers, existing financiers (e.g., banks that hold floating charges in the company) are disadvantaged in that the super-priority claims are prioritised over the assets covered by a floating charge. This has given rise to much debate on the implications of the super-priority rights and whether it is reasonable for, for example, a financing bank to see the value of its floating charge being diminished as a result of a restructuring without being able to object to its outcome. The reconstructor is, however, responsible for procuring that the value of claims secured by floating charges does not decrease more than necessary. Further, it should be stressed that the super-priority right does not apply to claims that arise (e.g., interest) during the restructuring under agreements entered into prior to the commencement of the restructuring. Apart from the super-priority right described above, Swedish law does not provide for any further special priorities. Restructuring also automatically imposes a moratorium on enforcements and termination of existing agreements and provides conditional protection against bankruptcy. The moratorium does not, however, apply to secured creditors that hold possessory pledges, which may be enforced if the relevant pledgee has a due and payable claim, meaning that the underlying debt must actually have been accelerated to be effective. Unless terminated prematurely by court order, restructuring may last for no more than three months, subject to an extension for up to nine months in certain circumstances. In our experience, the court performs a fairly summary review of the application – it is usual that the application be accepted (or, exceptionally, rejected) the same day. It is customary to submit the application before – often immediately before – the court opens for business to allow the court as much time for deliberation as possible. In practice, it has also proved relatively easy to obtain the prolongation, at least if the reconstructor supports it. The difficulties of Saab Automobile shows that, in some circumstances, renewed restructuring proceedings may also be granted very close to a previous failed restructuring. In the Saab case, the first restructuring was granted in 2009 and continued, unsuccessfully, through prolongation. In 2011 the company applied again for company restructuring. After having been denied at first instance, the application was granted upon appeal. Saab then carried out a second, prolonged and ultimately unsuccessful company restructuring. At the end of the restructuring (regardless of whether it has been successful), the reconstructor resigns and the moratorium is automatically lifted. The court will not be required to make any decision if the time allocated to the company restructuring merely elapses. After an unsuccessful company restructuring, the company will usually have gone through more of its liquidity and accumulated more debt than at the commencement of the proceedings (including a debt to the state corresponding to the state's guarantee for staff remuneration). This creates powerful incentives for creditors caught by the moratorium to act swiftly when the moratorium has been lifted; creditors who have not been prevented by the moratorium from enforcing their security (that is, creditors with security over specific assets) will often already have enforced security leaving the company potentially without crucial business assets. Unsecured creditors – such as suppliers and other trade creditors whose continued support is absolutely necessary to the continuation of business – will often have been hard hit by the moratorium and any compulsory composition, and may, therefore, be reluctant to assume continued credit risk after the end of company restructuring proceedings. This is one of the contributing factors as to why company restructuring proceedings often are quickly followed by formal bankruptcy. This is also a factor making informal restructuring by contractual negotiation earlier in the life of the ailing company an often more attractive solution to creditors. As a final reflection, treatment of the shareholders – or rather the inability to judicially involve the shareholders in the process – is thought to be a major challenge in any successful restructuring of an ailing company. One solution might be for legislation to abolish the artificial distinction between insolvency law, dealing with debt, and company law, dealing with equity, by allowing insolvency proceedings to also reconstruct the equity of a company. In the absence of any such Swedish legislation, however, it is often found that neither company restructuring nor bankruptcy proceedings provide the flexibility required, which may be an important contributing factor for both the frequent failures of company restructuring proceedings and the prevalence of informal contractually negotiated arrangements. As mentioned earlier, informal restructuring proceeds often involve a restructuring of both the debt and the equity. Bankruptcy proceedings are initiated as a consequence of a company becoming insolvent. The relevant test is cash-flow insolvency and a company may enter bankruptcy if it cannot pay its debts as they fall due and such inability is not merely temporary. Proceedings are aimed at winding down an insolvent company by way of selling its assets and distributing any cash received to the creditors. The normal result is a negative balance leading to the automatic liquidation of the company. Any positive balance accrues to the shareholders, who may choose whether to liquidate the company. The proceedings can be initiated by the company as well as by a creditor by filing of a petition for bankruptcy with the local court. The company's application will normally be granted without investigation of its merits. A creditor will have to prove that the conditions for bankruptcy have been met; but can in some specified circumstances rely on legal rules that shift the burden of proof to the debtor to prove that it is solvent. Contested applications are litigated in full civil trial. As regards the existing creditors of the company, neither unsecured nor secured creditors are generally free to take independent enforcement actions in bankruptcy. Secured creditors that hold possessory pledges may sell the security assets subject to such pledges at a public auction or, in respect of certain financial assets, in any other manner (including by way of appropriation). With the exception of certain financial assets, the administrator must also be given the right of first refusal to the security assets. A valid claim against a bankrupt company – regardless of whether it is due and payable – may be set off against a claim that the bankrupt company had against the creditor when the bankruptcy commenced. Any pre-insolvency planning (including planning of pre-commencement financing) is arranged with a view to avoiding clawback risks, minimising upstreaming complications and maximising the value and robustness of the security package. Other aspects that need to be addressed in this context include subordination of debt layers as well as limiting potential subrogation rights of intragroup security providers. The latter aspects are usually addressed in inter-creditor agreements dealing with both debt subordination and the waiver of subrogation rights by the intragroup security providers. The principal clawback provision under Swedish law is based on the Roman law concept of actio Pauliana (fraudulent conveyance) and, therefore, requires a degree of fraudulent behaviour in order to be triggered. Thus, that clawback provision will only come into play if the relevant transaction entails: (1) that a particular creditor has, in an unfair manner, been favoured in preference to other creditors; (2) the property of the debtor having been concealed from its creditors; or (3) its debts being increased, and provided that such transaction (by itself or together with other transactions) led to the company becoming insolvent. Another prerequisite is that the other person party to the transaction knew, or should have known, of the insolvency of the debtor and the circumstances making the transaction improper. Consequently, any recovery would have to be based on some degree of 'disloyalty' as against the relevant debtor's general collective of creditors. As Swedish law makes a clear distinction between the contractual creation of legal arrangements inter partes and the perfection of those arrangements erga omnes, care is usually taken to ensure that all important arrangements – in particular, security arrangements – have not only been created but also perfected in circumstances that would make a recovery action unlikely to succeed. For instance, perfection would typically be sought well in advance of the likely starting date for any suspect period (usually three months prior to the borrower's entering into formal insolvency proceedings) to avoid recoveries. When renegotiating or providing new financing to a group facing financial difficulties, debt providers often require that new or additional security and guarantees are granted by the borrower group. The debt provider in this scenario needs to pay close attention to the risk of such security and guarantees being subject to clawback in the formal insolvency proceedings in respect of the security provider. Under these rules, a security interest granted after the security provider incurred the secured obligations may be subject to clawback unless the granting of the security nonetheless can be considered as 'ordinary'. This exception for 'ordinary' transactions is sometimes referred to as a 'safe haven' for creditors, although it is difficult to clearly define a transaction as ordinary. Simply put, security or guarantees will be deemed ordinary in the event: (1) they were agreed no later than the incurrence of the debt or more than three months prior to the insolvency; and (2) the terms providing for security or guarantees have been implemented by the parties in a manner that does not amount to an opportunistic application of the terms with a view to a looming insolvency. However, the exception for 'ordinary' security has been introduced quite recently and Sweden therefore lacks court precedents on the subject. Some guidance may be found in the preparatory works to the legislation that states that in order to meet this condition (i.e., that the granting of the security is ordinary), the security should be granted in direct relation to the funding and not by reason of the security provider experiencing financial difficulties. According to the prevailing view in Swedish legal literature, on the other hand, one needs to make an overall assessment of the circumstances in which the security was taken, taking into account all circumstances of the transaction. The exception can also be considered from the view that the security transaction in any event may not diverge from what can be considered as normal and natural. A change of creditor will not, however, affect the validity of the security provided that the underlying claim remains the same and that the relevant transfer expressly includes the existing creditor's portion of the security securing the transferred debt. Similarly, the fact that a creditor has acquired its portion of the debt from another creditor would not generally restrict the new creditor from benefiting from the provisions under Swedish law granting a creditor the right of set-off under certain circumstances. However, the right of set-off may be restricted in the event that the creditor assuming the debt had (or should have had) knowledge about the debtor's financial difficulties and consequently has acquired the debt in order to improve its situation in any insolvency proceeding affecting the debtor. Any security that is deemed to have been granted for 'old' debt will be at risk of being subject to clawback during a hardening period of three months from the time that the security is perfected. The hardening period may, however, be up to five years if the security provider was insolvent at the time that the security was perfected. The five-year hardening period applies to certain intentionally fraudulent or conniving transactions whereby a certain creditor is unduly favoured over other creditors in such a way that the debtor's assets have become unavailable to its other creditors. The extended hardening period also applies where the effect of the fraudulent transaction is that the debtor has assumed additional debt. A general criterion for the extended hardening period is that the debtor was insolvent when the transaction took place or became insolvent through the transaction (either independently or in connection with other transactions). The hardening period may, however, be unlimited to certain connected persons who are assumed to have the required knowledge about the debtor unless they can show that it was reasonably likely that they did not have the information. As regards third-party creditors, there is a 'safe haven' to the extent that they did not have any knowledge of the debtor's insolvency and that they did not have knowledge of any circumstances that would render the transaction inappropriate. As mentioned above, a number of clawback provisions are triggered if and to the extent the relevant debtor was or became insolvent as a result of the transaction. Pursuant to the Swedish Bankruptcy Act, a company is generally considered to be insolvent if it lacks the ability to pay its debts as they fall due and such inability is not just temporary. This definition and the interpretation of it have been subject to much debate among legal scholars and practitioners as the exact point in time when a company is deemed insolvent has several implications. However, the prevailing view among scholars and practitioners is that a company that cannot pay its debts when they fall due could, nonetheless, be considered solvent if the company has a realistic plan for successfully restructuring the company and finding a long-term financing solution. Whether a company is solvent is, therefore, to be separated from it being liquid, which relates to the company's immediate ability to service its debts rather than the company's financial situation over a longer period. For example, a company with a strong balance sheet will likely be able to pay its long-term debt, but might at a particular time lack the liquidity to service its debt. In addition to the clawback risks, any security or guarantees that are granted in violation of the relevant provisions may make directors of the company personally liable for losses incurred by a creditor due to the mismanagement of an insolvent company. Such mismanagement is generally considered to include the directors' having continued the company's business past the point when they knew, or should have known, that there was no reasonable prospect of avoiding the insolvency of the company, and did not take the required steps with a view to minimising the potential loss to the company's creditors. In addition to the risk of incurring personal liability for losses incurred by the company's creditors, a director may face criminal charges for crimes against creditors, as set out in the Swedish Penal Code. These offences include situations in which a director is deemed to have acted carelessly towards the company's creditors or to have favoured a particular creditor by, for example, paying a debt that had not fallen due or providing security or guarantees that were not required under the terms of an existing agreement. Swedish bankruptcy law is based on long-standing principles and company restructuring, although a fairly new procedure (introduced in 1996) is largely based on older law dealing with compositions. After 2010, several official committees have presented proposals for amendments of the Swedish insolvency regime. In 2010 it was proposed to unify the separate bankruptcy proceeding and company reconstruction proceeding into a new unified 'insolvency proceeding'. On 17 October 2016 the Entrepreneurship Committee presented a new proposal with an objective to give companies 'a second chance', but also to reduce the risk that companies that have no chances of becoming viable get protection under a formal company restructuring and thereby delay a liquidation of their assets. The proposal includes, amongst other things, changes to the rules on judicial composition, introduction of specialist insolvency courts, increased ability for the debtor to transfer rights under contracts, protection under the proceeding already from the filling of the application rather than from the opening of the proceedings and a requirement for a liquidity prognosis to be provided at filing. It is not yet clear if the proposals will result in any changes of the laws. The financial distress of a group often requires that the terms of its existing financial arrangements be renegotiated in order to, inter alia, reset financial covenants, provide a more flexible amortisation structure, defer interest payments and allow for various restructuring measures. These actions are often sufficient if the business generates free cash flow. It is not uncommon, however, that a group facing financial difficulties may need additional liquidity to continue to operate or capital for necessary investments. In such cases a successful restructuring of the group will not only require a strengthening of the balance sheet by reducing the debt but also additional financing from either existing stakeholders or third parties in order to provide additional liquidity or finance the necessary investments. In the event of a balance-sheet problem where existing shareholders cannot provide sufficient equity, the improvement of the balance sheet can be supported by the lenders through a debt-to-equity swap. An example of a Swedish debt-equity swap transaction launched in recent years is the Nobina group restructuring. Nobina had issued a US high-yield bond and was expected to fail to meet its repayment obligations under its US bonds. The solution included an exchange of the US high-yield bonds for new Swedish law-governed high-yield bonds and shares in the parent company of Nobina. The settlement of the transaction took place across Euroclear Bank and Clearstream Luxembourg for the US bonds that were exchanged against new Swedish high-yield bonds held by Euroclear Sweden. Simultaneously, a portion of the existing US bonds were used for an in-kind share issue in the parent company of Nobina. The end result was a dilution of the shareholders and a significant reduction of the debt. This was a successful out-of-court restructuring and saved Nobina from entering formal insolvency proceedings. Through this solution the debt level was decreased and the currency exposure was reduced, giving the company the necessary means to survive long term and develop its business. Another type of 'debt to hybrid equity swap' was recently employed in the restructuring of the Basler Fashion group, a distressed group within the fashion industry, where the senior debt providers swapped their senior claims against the operating entity against a value participating debenture in the ultimate parent company, giving the value participating lenders the right to a certain percentage of the group's profits, instead of an outright ownership stake. In addition, a majority interest in the group was transferred to a trust vehicle with the ultimate aim of selling the group to an investor after the conclusion of the operative restructuring. From a lender's perspective, this type of hybrid solution can be an attractive alternative as the lenders can avoid taking ownership of the group at the same time as they can benefit from the economic value or profit generated by the group. Whether a financially distressed group requires that the terms of its existing financial arrangements be renegotiated or if it also requires additional financing will have a significant impact on the financing process. A provider of new or additional financing to a financially distressed group often requires more control and economic return as compared with the existing stakeholders. The new finance provider will usually also be in a position to elect – taking certain legal, practical and commercial aspects into consideration – the way in which the new funds will be provided.3 The different type of financial instruments available can be used and combined in a way to achieve the most feasible restructuring of the group, considering the different stakeholder positions and also the group's need for a new capital structure. In practice, a combination of a renegotiation of the terms of the existing debt together with the provision of new debt is often sought. As set out above, the additional financing can be provided by way of debt, common equity, preference shares, convertible loans or various other forms of hybrid debt instruments. Which financing method is preferred varies depending on numerous factors, including whether the relevant company is in a position to take on and service additional debt and on the financing provider's preferences. The low oil prices are continuing to put pressure on industries with direct or indirect exposure to energy prices. In addition to companies with direct exposure to the oil price, wind power companies are also facing difficulties. The listed wind farm company Aligera was, for example, forced to apply for bankruptcy in December 2017. Tighter lending regulation for banks' retail property lending combined with excess supply in certain parts of the more high-end part of the property market has resulted in a slower pace for the selling of new flats in certain property development projects. Property development companies with a large stock of unsold flats or with new flats coming to the market may, therefore, find it more difficult to attract external financing. Another industry under pressure is the print media industry. On 23 May 2016, 16 entities in the Stampen group owning local newspapers, printing facilities and newspaper distribution companies in the western part of Sweden applied for formal company restructurings. In terms of the number of companies involved, this is the largest company restructuring in Sweden. It should also be noted that the growing high-yield bond market has added a layer of complexity to restructurings. Restructuring of bonds is significantly different to restructuring of bank loans. The bonds are traded freely and it is sometimes difficult to identify and convene a bondholders committee with the sufficient majority. Also, the sharing of information can be sensitive from an insider perspective, which makes restructuring negotiations more difficult. More importantly, the objectives of the bond holders differ more than among lenders in a bank group. There are participants in the bond market who acquire distressed debt with the aim of subsequently acquiring control over the equity interest in the borrower. There is also an increasing number of bond investors who target financially distressed bond issuers by acquiring corner positions at a significantly discounted price. The corner positions are then used to block any consensual restructuring proposals until that investor is bought out at a higher level than its original investment or the borrower is forced into equitisation. The restructuring strategies employed by the borrowers may also entail strategies regarding the timing of information to the market to manage the pricing of the bonds before restructuring proposals are launched. It may be easier to achieve a restructuring solution if many of the bond holders have acquired their bonds significantly below par. Examples of recent restructurings that involved bond debt and debt-for-equity swaps are RURIC (Russian Real Estate Investment Company), a real property development and investment company owning assets in Russia; Trigon Agri AS, a soft commodities producer with operations in Ukraine, Russia and Estonia; and PA Resources AB, an oil and gas company. PA Resources used a formal company restructuring proceeding in a novel way. As part of a composition procedure, the creditors were offered an additional alternative to being paid a certain fixed percentage of their debt within a year, as prescribed by the Swedish Company Restructuring Act. Creditors could choose to be paid an unknown sum out of available cash from the sale of certain assets during a specific period, after which the remainder of their claims would be converted into equity of the company. Creditors holding a large majority of the claims on the company accepted the offer to be paid out of available cash and participate in a debt-for-equity swap. Other recent larger company reorganisations also include INDISKA, a retailer focusing on clothing and interior decoration, and Teknikmagasinet, an electronics retailer. Traditionally, Swedish insolvency law has been characterised by a certain asymmetry in respect of the international ramifications of a company's insolvency. The basic rules are that foreign insolvency proceedings are not recognised or enforced in Sweden, and Swedish insolvency proceedings in respect of a Swedish entity are universal and, in respect of a foreign entity, includes all its assets in Sweden (but not elsewhere). The first rule has been modified by, first, treaty law in the Inter-Nordic Insolvency Treaty and, second, by the EU Insolvency Regulation (originally Council Regulation No. 1346/2000 on insolvency proceedings as recast by Regulation No. 2015/848 on insolvency proceedings) (EIR). The treaty is now only effective in respect of Denmark, Norway and Iceland, with the effect that insolvency proceedings in those jurisdictions will be given effect in Sweden as if they were Swedish. In respect of Finland, the treaty has, to all intents and purposes, been superseded by the EIR. The EIR, insofar as it seeks to encourage the cooperation among the courts of the various Member States in respect of insolvency proceedings, would not in principle be a novelty for Swedish courts. There have long been special arrangements with the other Nordic countries enabling and encouraging courts and administrative authorities in the various states to deal directly with each other and to cooperate as appropriate. On 22 November 2016, the European Commission issued a proposal for a new directive which aims to introduce effective preventive restructuring frameworks across Europe. The proposal is in an early stage and will be subject to negotiations and (most likely) amendments before it can be approved by the European Council and the European Parliament. Thereafter each Member State must implement the proposal into national law before it will become effective. This process will likely take several years to complete. As mentioned in Section III, several proposals to amend the Swedish insolvency legislation have been presented by official Swedish committees during the last couple of years. Furthermore, in June 2015, the Nordic-Baltic Insolvency Network published the Nordic-Baltic Recommendations on Insolvency Law. The Nordic-Baltic Insolvency Network consists of academics and practitioners from Sweden, Norway, Denmark, Finland, Estonia, Latvia and Lithuania, and its main purpose is to encourage efforts towards a harmonisation of the substantive insolvency laws of the member countries. It remains to be seen if it will influence Swedish insolvency laws. Carl Brodén is finance and restructuring counsel at Roschier Advokatbyrå AB. 2 An interesting and practical implication of the turnover provisions in the context of bond financing is that it is virtually impossible to enforce a traditional turnover provision against a large and often unknown collective of bond investors. The practical solution provided is instead that the a corresponding amount of any funds received by a bond investor which should have been turned over to the other creditors, will be withheld by the security agent the next time any funds are run through the payment waterfall in the intercreditor agreement. 3 For example, by way of debt, equity, preference shares, convertible loans, value participating loans or any other form of instruments.